A spectacular new addition to the boutique Tenuta di Trinoro wine estate, Il Coccetto sits betwixt high mountains, award-winning vines and a wonderful broad expanse of cobalt blue sky. On the doorstep is the town of Sarteano, convenient for shops and bars and close by are the medieval hilltop towns of bustling Montepulciano, famous for its Vino Nobile, Pienza, where local tradition thrives amongst spectacular architecture and Montalcino, at the core of the Brunello wine estates. 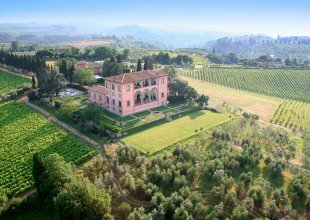 Located 300 metres above the valley floor in the southern end of the Val d'Orcia, under 30 minutes to the key towns of Pienza, Montepulciano, Bagno Vignoni and San Quirico d'Orcia and under 45 minutes to Montalcino and the Brunello vineyards. Set in the midst of Trinoro's 500 acre award winning wine estate, the property features a superb 17 x 7m heated swimming pool and 6000 square metres of gardens, with a vegetable garden that supplies the house with wonderful fresh produce. The outdoor dining patio seats up to 14 and makes for a superb place to take in the surrounding countryside. Interiors have been put together by renowned Italian designer Ilaria Miani and are a classic combination of rustic features with modern design that work well to create a superb country home. The six large bedrooms, spread over two floors, are all en suite and come with their own dressing rooms. In addition there are two very comfortable sitting rooms, a dining area that can seat as many as 20 guests and a superbly well-equipped kitchen. The whole house is air-conditioned and also provides heating for those wanting to experience this amazing part of the world off season. Nothing has been forgotten, from high speed Wi-Fi to hairdryers in all the bathrooms, Satellite TV and a PC and printer for guests use. The villa even comes with its own GPS device to help you explore the Val d'Orcia.